An accomplished physical therapist with nearly 40 years of experience, Dr. Foudy takes pride in being experienced in a wide variety of settings, including rehabilitation, geriatrics, neurology, orthopedics, pediatrics and training. For the past three years, she has served as a doctor of physical therapy with Health South, where she is tasked with taking care of a diverse adult population with orthopedic problems. In this position, she oversees acute care, the intensive care unit, cardiac rehabilitation and first phase neurological CVA treatment. A lifelong learner, she enjoys challenges and believes her ongoing success can be largely explained by the enjoyment she finds in her profession. Dr. Foudy found her passion for health care while she was doing volunteer work in high school. From there, she earned an associate degree in physical therapy assisting. About a decade later, she attended Hunter College, where she earned a Bachelor of Science in physical therapy in 1993. She completed her education at Stony Brook University in 2005, when she completed a Doctoral Degree in physical therapy. 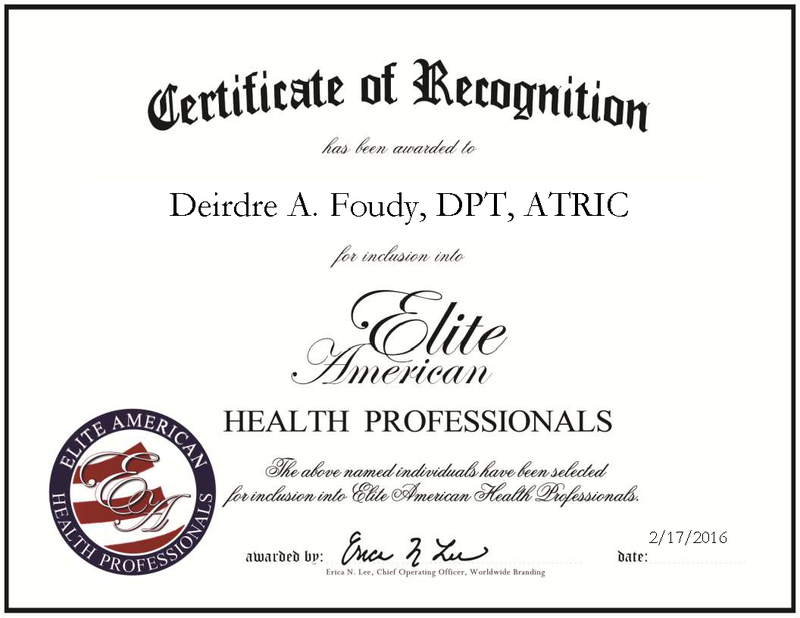 In addition to being licensed in New York, Florida, North Carolina and Maryland, Dr. Foudy is also certified in aquatic therapeutic exercise. Prior to joining Health South, Dr. Foudy was an independent practitioner for many years in the home health care arena. Her professional affiliations include the Florida Physical Therapy Association and American Physical Therapy Association. When she isn’t busy assisting patients, Dr. Foudy serves as an adjunct professor at Stony Brook University and LaGuardia Community College. As she moves forward with her career, Dr. Foudy looks forward to branching out and providing traveling therapy in different parts of the country, with a focus on gathering different processes, procedures and techniques, and having them utilized everywhere. This entry was posted in Physical Therapy, Uncategorized and tagged geriatrics, independent practitioner, neurology, orthopedics, pediatrics, rehabilitation, training. Bookmark the permalink.